MEXICO CITY, Apr 30 2009 (IPS) - No indigenous woman has ever held a seat in the Mexican Congress. But two of them, one belonging to the conservative ruling party and the other representing the leftwing opposition, are trying to change that in the July legislative elections. However, their chances are proportional to the little to no support they have received from their own parties, the poverty and discrimination faced by native women in Mexico, and the sexism they often face within their own communities. According to official figures, 34.5 percent of indigenous women in Mexico are illiterate, compared to 19.6 percent of indigenous men – and only eight percent of the general population. In addition, of every 10 people in Mexico who speak only an indigenous language, and not Spanish, six are women. Mexico is the Latin American country with the largest indigenous population in absolute numbers, which is variously estimated to make up between 12 and 30 percent of the country’s 104 million people (the smaller, official, estimate is based on the number of people who speak an indigenous language). The overwhelming majority of the Mexican population is of mixed indigenous and Spanish ancestry. “Our lives are marked by suffering and obstacles; there are communities where people still believe that if a woman gets involved in politics, an earthquake will happen, and some families believe girls should not study, that schooling is for boys and men,” Rogelia González, a Zapoteca Indian woman, told IPS. González will run for a legislative seat for Oaxaca, a state where a majority of the population is indigenous. A study by the National Women’s Institute, a government body, based on a 2003 household survey found that 75 percent of indigenous women respondents thought that a good wife should obey her partner, while 84 percent believed that the husband was responsible for household expenses. One-third of the native women interviewed said a husband had the right to hit his wife if she did not fulfill her obligations; 42.6 percent said they had been beaten as girls; and 46.6 percent said that if children misbehave, parents have the right to hit them. The leadership of the governing National Action Party (PAN) and the leftwing Democratic Revolution Party (PRD) gave the impression in February of encouraging changes to fight the historical marginalisation of indigenous women when they registered the two women as precandidates for the Jul. 5 elections, when Mexicans will elect 500 members of the lower house of Congress, six state governors, 565 mayors and 434 state legislators. But in April, the situation took a radical turn. “They removed me from the list of candidates, but I know I still have a chance, so I hope the PAN will think it over. Otherwise I will take measures that I don’t want to take,” Cecilia López, a member of the Tzeltal community from Chiapas, where at least one-third of the population is indigenous, told IPS. Despite the extreme poverty into which she was born, the 34-year-old López managed to earn a university degree in psychology, and is now coordinator of government social projects in rural areas of Chiapas. She registered as a precandidate for the lower house of Congress representing the PAN, after community assemblies in the region decided that she should represent her people in the federal legislature. “The wife of the president herself (Margarita Zavala de Calderón) told me that she supported me, that she was my ‘comadre’ (roughly, crony or friend), and my brothers and sisters in the highlands of Chiapas decided that I should participate,” she said. But in mid-April, the PAN leadership eliminated López from the list of candidates and replaced her with a non-indigenous businessman who has not even worked in the area he claims to represent. López is trying to get the ruling party to reverse that decision and put her back on the list. But that would have to happen before May 2, the deadline for registering candidates. “I still have a chance,” she said, nonetheless. González is facing a different situation, albeit one that has had similar results. The 48-year-old bilingual teacher who is active in the PRD aspires to a seat representing her home state of Oaxaca, where 418 of the 570 municipalities are governed by traditional usage and customs. After encouraging her to run, the party leadership put González’s name in the 11th spot on a list of 15 candidates – tantamount to excluding her altogether. “I know it’s true that no more than the first five people on a list, or seven or eight in the case of an extremely broad victory, are ever elected,” she remarked to IPS. González and López described their difficult childhoods, in communities where tradition holds that women do not need to study and should marry at a very young age. Both women said that such beliefs have gradually given way in some areas thanks to the work of government bodies, civil society, and both male and female indigenous leaders. López is from Oxchuc, a rural municipality where 40,000 people are scattered in 10 villages. The great majority are Tzeltal families who depend on small-scale farming for a living. According to the census, some 285,000 people belong to her ethnic group. Oxchuc is near the area of influence of the Zapatista National Liberation Army (EZLN), a barely-armed indigenous guerrilla group that briefly rose up in arms in January 1994 demanding true democracy and respect for indigenous rights. After just two weeks of skirmishes with government forces, the EZLN agreed to peace talks and an armed truce. Today the Zapatistas are a marginal actor on the Mexican political scene. González, meanwhile, is from Juchitán de Zaragoza, one of the largest towns in the state of Oaxaca, with a population of 90,000, located near the Pacific ocean. Trade is one of the main economic activities in that area. González, who divides her time between political activism, her job as assistant director of a bilingual preschool, and her activities as the head of a network of women’s centres that provide assistance to victims of domestic violence, belongs to the Zapoteca community, which has a total of 452,000 members. “Because of machismo, we men have not respected women at all. But changes are happening, like these two candidates to the Chamber of Deputies, and that’s good,” Valdemar Morales, a civil engineer belonging to the Tzeltal community who backs López’s candidacy in the PAN, told IPS. 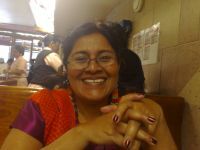 In March, Eufrosina Cruz, a member of the Zapoteca community, presented a new civil society association in the Mexican capital to fight what she called the “abuses and customs” that govern many indigenous communities, especially in Oaxaca. Although under Mexican law, traditional uses and customs are only valid as long as they do not contravene rights granted by the constitution, that is not always the case. Cruz, who is 29, was blocked from running for mayor of her village two years ago because of the uses and customs of her community, according to which women cannot stand for office. She took action to fight the decision, drawing national attention to the issue, which brought her death threats but also prompted Oaxaca state legislators to pass more specific laws to combat discrimination against women. In the current debate for the July elections, practically no one has referred to the fact that indigenous women stand a very small chance of winning a seat in the lower house of Congress. Indeed, no one seems to be surprised by, or even aware of, the fact that they have never been elected to the legislature. “Gradually, both legislation and society in general have made room for women’s rights and for their insertion in national life,” Martha Díaz, secretary of the Chamber of Deputies indigenous affairs committee, remarked to IPS. “It is necessarily an ongoing process, and in some cases, like the case of indigenous women, it is quite slow and not very visible,” she admitted. Díaz, who represents the PAN, said she was confident that soon native women would be represented in the legislature. From her point of view, what are needed are policies giving native women and girls an opportunity for education, and greater efforts by the state in indigenous communities. To promote gender equity, the current election laws require parties to reserve at least 40 percent of the spots on candidate lists for women. But the quotas say nothing about indigenous or black women, or members of sexual minorities. “The law has not been effective, because sometimes the parties cheat,” by naming women only as alternates on the lists of candidates, for example, Emilienne De León, director of Semillas, a local NGO that promotes leadership by indigenous women, told IPS. De León believes it is necessary to adopt laws that force political parties to reserve a portion of candidacies for indigenous and black women, and members of sexual minorities. “This kind of law is necessary to foment equity and representativeness,” she argued. In the Chamber of Deputies, where seats are renewed every three years, women have held 24 percent of seats in the last six years. In the Senate, whose members are elected every six years, the proportion is 21 percent. But none of the women legislators are indigenous. There are a few isolated cases of indigenous women mayors and members of state legislatures. It is not easy for indigenous men to gain access to elected posts either, and very few have in fact made it to the national Congress. But native women face hurdles to political participation both within and outside of their communities.